Joy Creek Photo Archive (c) all rights reserved (Clematis macropetala x C. alpina) The somewhat narrow sepals of Clematis 'Rosy O'Grady (Skinner, 1964)' are purple pink with darker veining. Their edges curl back slightly revealing the pale pink outer skirt of staminodes. Lovely red brown stems. All of our Clematis are two year old plants that are suitable for immediate planting in your garden. Midspring to late spring; some summer re-bloom. 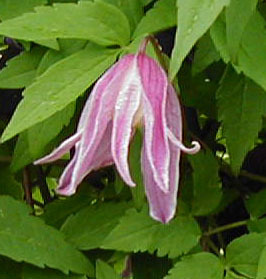 9-12 ft.
Vines from Clematis Section Atragene have lantern-shaped flowers from April through May. Their silky seed heads are attractive throughout the season. These bloom on old wood. Prune or tidy up after bloom or cut back hard soon after bloom to revitalize.